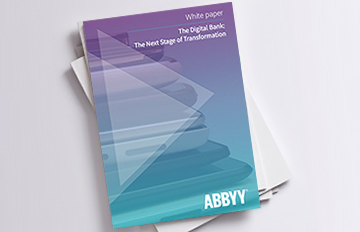 ABBYY process automation and capture solutions enable financial institutions to replace traditional paper with digital documents that are easy to search, access, manage and process. In this way, it is possible to address the need of attracting new business and customers, more effectively serving existing clients, reducing costs, increasing profit, preventing fraud and meeting regulatory compliance issues. By automating the bank account opening process institutions remove costly and error-prone manual work, ensure high-quality and accurate data quality Capture and speed up the overall process. ABBYY solutions help banks and financial institutions to optimise and accelerate loan and mortgage processing through capture of the application, classification of the supporting documents and export to the relevant backend system. In order to remain competitive in today’s changing structural environment, banks and financial institutions must optimize their key processes. Often these processes are paper-intensive; automating these processes offers banks new ways to improve increase customer service, allows them to compete for new customers and enables them to improve profitability. Paper-based processes can include new account opening, credit card applications, loan origination and check fraud prevention. Often these processes originate in remote branch-offices and must integrate with a head office for centralised processing and approval. For example, a typical mortgage loan application consists of various document types totalling in excess of 100-200 pages. To effectively streamline this process and integrate remote offices banks can implement one solution to scan the documents, classify them by type and automatically extract key information to be fed to a back-end system for processing. ABBYY’s solution enables scanning and verification of loan applications and supported documents right at the point of entry in a single Web-based interface. Once captured, the data from these documents is transferred to a scoring system that provides information on the client’s credit worthiness and makes a recommendation about whether to authorize the loan. The decision about whether to issue the loan and for what amount is dependent on this data. Capture at the point of service and linking with centralized head office processing. Scanning and validation can be performed via a web-based interface. Reduce turnaround and processing time by eliminating manual labour (sorting, classifying, searching). No installation is necessary in branch offices. Classification and data extraction is possible from any type of form or document. Centralise all processes for mortgage loans, account opening, credit card application processing, etc. on a single platform. In today’s competitive environment banks need to concentrate on the customers that bring in business. Delivery of superior customer service helps keep customers satisfied and help save time in the bank account opening process. By automating the bank account opening process institutions remove costly and error-prone manual work, ensure high-quality and accurate data quality capture and speed up the overall process. Employees at customer service centres or those at branch offices can capture all documents from their customers, extract relevant meta data, validate the meta data against the documents and forward it on for centralised processing. Required documents like application forms (handprint recognition), ID cards and proof of residency, can be captured from any device and automatically classified. Missing or incorrect data can trigger an exception handling, which ensures that only correct and high quality data enters the bank's backend systems. To open a new bank account customers must fill out an application and include multiple supporting paper documents. ABBYY’s bank account opening platform enables bank employees to automatically capture and verify all relevant documents from customers directly in a Web browser and send them to back-end systems for immediate processing. Reduce expensive, time-consuming and labour-intensive manual data entry from credit card application processing by automatically capturing, classifying and extracting customer information. Improve the fraud prevention process by optimizing the validation and proof of financial documents. Integrate signature comparison to ensure legal validity of documents. Optimisation of manual credit card application processing enables banks and financial institutions to speed up service delivery to their customers. Significant cost savings can also be achieved if those manual processes are automated with the help of software.When a client wants to obtain a credit card from a bank, he has to complete an application form and to provide some additional documents like the photocopies of his passport or proof of income. The information from an application form should be entered into the lender's database together with the accompanying documents. With help of ABBYY’s solution for credit card application processing, banks and financial institutions can automatically capture data, classify documents and extract information from the credit card application. It allows the organization to reduce expensive, time-consuming and labour-intensive manual data entry, and therefore increase productivity by freeing staff to focus on other important issues. With ABBYY FlexiCapture, you will be able to process more applications and eliminate possible delays. Today many banks are trying to reduce paper check transactions because handling paper documents is expensive. But bank customers still use cheques in record numbers, which fosters the spread of check fraud. By automating check processing banks can achieve significant cost savings and reduce turn-around time. Mobile Capture allows end customers to file checks from anywhere through various input devices. Centralised processing with validity checks against customer information reduces error-prone and slow manual processing and speeds up the time to payment. Hand-printed text from incoming checks can be identified and extracted automatically and the critical data instantly fed to a back-end system. When the bank receives a check, ABBYY technology looks up reference images in a centralized database to verify the authenticity of the check and prevent potential forgery or counterfeits. It is also possible to connect a signature comparison module to match signatures to existing records. Thus a major problem that affects financial institutions can be solved with ABBYY. Banks, credit unions and other financial organisations can automate financial document processing, organisation and archiving of client files. ABBYY’s data capture solution can help banks, credit unions and other financial institutions automate financial document processing, organisation and archiving of client files. A digital archive allows banks to retrieve information from financial documents easily and also enables sharing of documents between employees. Implementing an e-archive in a bank or credit union allows the institution to significantly optimise an important business process. The impact of RPA and AI on today’s banking processes – from customer onboarding over credit decisions to headcount transformations. Automate data entry, eliminate paper document shipping, and standardize processes for document capture, save costs on paper storage, including labour and real estate. Capture documents at the point of entry and speed up customer service using ABBYY solutions’ easy-to-use Web interface for scanning and verification. Streamline and automate daily operations such as account opening, credit card application management and loan and mortgage processing. Meet regulatory requirements, save money and protect the institution’s reputation by tracing data, completing full audits and detecting and preventing fraud. Banque Populaire de l’Ouest digitizes and automatically classifies incoming credit applications from various channels. Europe’s third largest bank allows corporate customers to pay paper bills using bank’s own app on their mobile devices. Freo speeds up processing and classification of consumer credit application and benefits from quicker decision making. Learn more about ABBYY products that power ABBYY automation solutions for banking and finance. Find out how ABBYY automation solutions for Banking&Finance addresses your organization needs.